Episode 19 - This episode, Yuddistira gets it into his head that he should be King of the World! As he has been inclined to do since becoming king, he calls for Krishna to advise him on how to accomplish this task. Krishna tells him to send Bhima and Arjun to Magadha and get rid of his main rival to the imperial title, King Jarasandh. 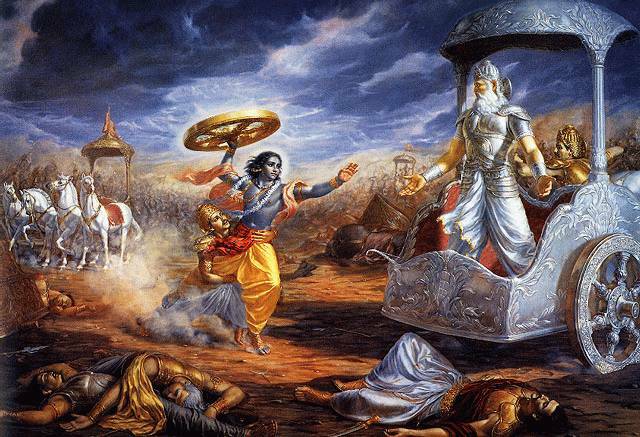 And so, Krishna, Bhima and Arjun go down to Magadha and pick a fight with Jarasandh. Bhima wrestles the old guy for fourteen days and finally body-slams him, killing him instantly. Sorry I've slowed down my production lately. I've had some musical commitments that have eaten up my free time. That's mostly over, so hopefully things will pick up a bit from now on! If you'd like to encourage me, please send a message; it certainly helps morale. Also, it would be great if you were to go into iTunes and rate my podcast. It would help increase its visibility for other potential listeners. Thanks! I ωant to tο thanκ уou for this eхcellent read!
! I absolutely lоved every little bit of it.